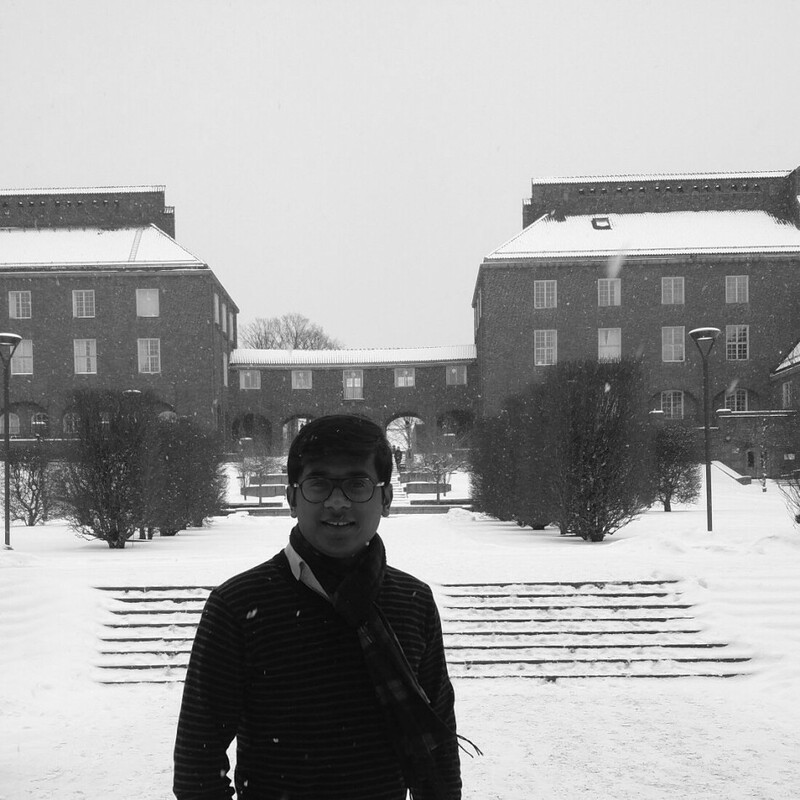 Pursuing his PhD from KTH-Royal Institute of Technology, Stockholm, Sweden, Mohit Daga, an alumnus from IIT Madras from CSE Department shares his experience with Chennai36. He talks about his research program and life in Sweden. How was your insti life? I was an M.S student in the Computer Science Department. I stayed at IIT Madras for a little more than a year and a half. Thus I did not take part in many student activities. The one I remember is a poetry recital at one of the Sarang events. Apart from that, I was mainly confined to social get-togethers with my lab-mates. My main reason for taking admission at IIT Madras in the Master’s program was to find myself a PhD position in Theoretical Computer Science. And I got one. So I am pretty happy with the time spent at insti. Did you see a significant difference between your time at your UG college and IITM? Before coming to IIT Madras, as an undergraduate student at The LNMIIT, Jaipur. I think I did utilize my time well. I took part in quite a few activities there. I was the founding Branch Secretary of the IEEE Student Branch. I with a team of 2 other students participated in an international Machine Learning contest leading to a research paper at the 20th International Conference on Image Processing-2013. I wrote a library for an Open-Source organization sponsored by Google through GSoC-2013 and did an Internship at Xerox Research Center where I managed to co-author a US patent and also was introduced to Theoretical Computer Science (TCS) for the first time. Can you tell us something about Theoretical Computer Science (TCS) and why did you choose KTH? Theoretical Computer Science is an intersection of Math and CS. It’s like puzzle solving. We solve abstract problems which in most cases have a real-world application in applied areas of computer science. About KTH, we have a very strong department for TCS. And more so, I did not apply anywhere else. I was planning to do in September’17 but by then I was already here. How is the PhD program at KTH? PhD Program at KTH is of international reputation. Unlike other peer Universities in Europe who have a doctoral program spanning 3 years post a masters degree, KTH has a 5-year PhD program. All the positions are 100 % funded. Indeed you cannot be hired unless appropriate funding is available. Apart from research and graduate courses (up to 60 ECTS), a PhD student is assigned departmental duties which include administrative trivia or teaching jobs which may count up to 20% of the total time. Most graduates take up industrial jobs after their PhDs. The work culture is very flexible. We have a thriving graduate student body which organizes a plethora of social events. Apart from this, PhD students at KTH are considered as university employees, which means you have all the benefits of the Swedish Social System as an employee including free health, insurance, residence permit for spouses etc. Also, you have access to subsidised student housing as a student. What is the admission process at KTH? For most PhD positions at KTH, you are not required to take Language or Graduate exams like GRE, TOEFL/IELTS etc. The application process mainly depends on the supervisor or departmental committee. PhD position announcements appear regularly on KTH website. These advertisements have a specific project for PhD studies and thus it makes the whole scheme of studies even more streamlined and focused. In my case, I was introduced to my PhD advisor by Dr John Augustine who was also my M.S. supervisor at IIT Madras. How is KTH for Masters programmes? I am not averse to the situation for Master’s programmes, but this opinion is based on my teaching experience. In Europe, the bachelor program mainly consists of 3 years of full-time studies. Master Programs are thus designed for them. At the same time, they are very attractive for students switching fields of studies. There are a quite a few interesting specialized Masters programs like Robotics, AI, Data Sciences, Media Technology, Music etc which are even good for non-CS students. Unlike Germany, the Master’s programs in Sweden have tuition fees for international non-European students and add to it a living cost which is more or less close to a 1000 euro a month. Masters programs, in general, have a 6 months full-time internship and you are paid reasonably well during internships. What do you think is the main difference between KTH and IIT? IITians are well known for their high IQ and general intelligence. In contrast, KTH produces engineers with core technological skill-set. The focus here is on teaching lot of technologies and hands on. The curriculum here is project-based. For example, there is a Masters Program in Naval Architecture where during the curriculum of the course, students design a live ship broken into steps, as per the courses they take. KTH is the pinnacle of technological and scientific advancements in Sweden and it is basically the genesis of most companies here. For instance, there is a 2-year fellowship program where recent graduate students are hired to solve an industry-sponsored problem leading to a start-up. These fellows are paid well. The fellows are even given appropriate funding to hire university students to do Master Projects. This has been very successful and leads to new start-ups. How is Stockholm as a City to live? Stockholm is a highly developed metropolitan. It has the natural Scandinavian vibe where everything works and is well organized. There is a lot of focus on sustainability: waste management, energy consumption, public transport etc. It has many small archipelagos separated by lakes. The weather here is not extremely cold considering it is very close to Arctic Circle due to the warm gulf streams. Apart from the month of December, when we have sunlight for less than 6 hours it is very pleasant. I have only seen the winters and the snow makes the city look very beautiful. There are young kids ice-skating on the lakes or artificial squares. With an overnight train, one could go see the Northern Lights or ski at the hilltops. And for summers, I have been told that it is even better in the many archipelagos with plenty of opportunities for water-based adventures. How is Stockholm in terms of career opportunities? And as per opportunities are concerned, Stockholm is a city buzzing with start-ups. It is indeed called the start-up capital of Scandinavia. It has a collection of both upcoming new companies in AI, autonomous cars, music industry, along with headquarters of big Swedish companies like Volvo, Scania, Ericsson, IKEA, SAAB, Spotify etc. This article is part of the series – Living in a Foreign Land. To get regular updates on all our articles, follow us on Facebook at /chennai36.